I’ll be running the above ad in the Seattle Times on Sunday Nov. 11 A-section. Why does the Cheasty Greenbelt exist? Cheasty is a greenbelt remnant on Beacon Hill to the east of the public golf course. It is forested only because during the time period in which Seattle’s residential areas were substantially all built out, developers couldn’t build there because it was too wet and in many places too steep. Houses that were built all slid down the hill and had to be condemned and removed. As a result of this wetness, it is forested mostly in deciduous trees. I have heard compelling arguments that this was deciduous in Native-American times, others strongly dispute this assertion, saying “Beacon Hill was all coniferous” (which I doubt). Regardless of who is right on that question, the deciduous dominance and the wetness of Cheasty has resulted in a rich avifauna there. 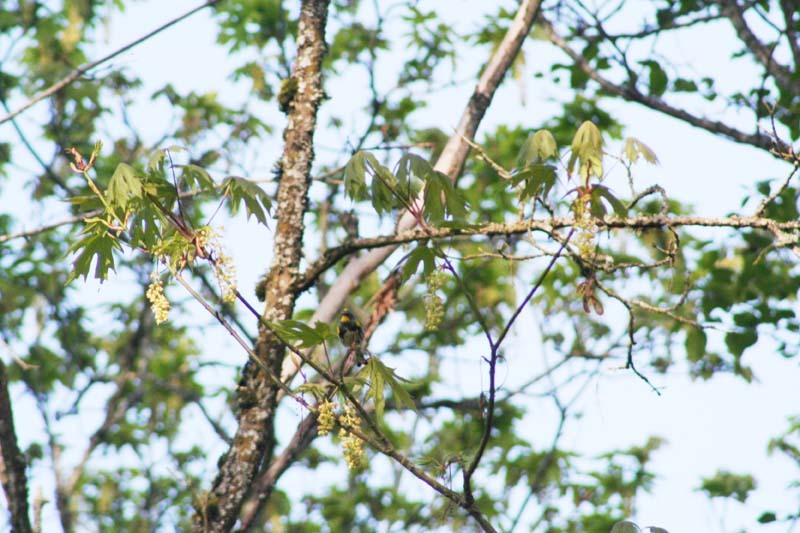 It is particularly good for deciduous and mixed forest specialists that nest and forage in the mid-canopy like Pacific-slope Flycatcher, Wilson’s Warbler, Orange-crowned Warbler, and Warbling Vireo. 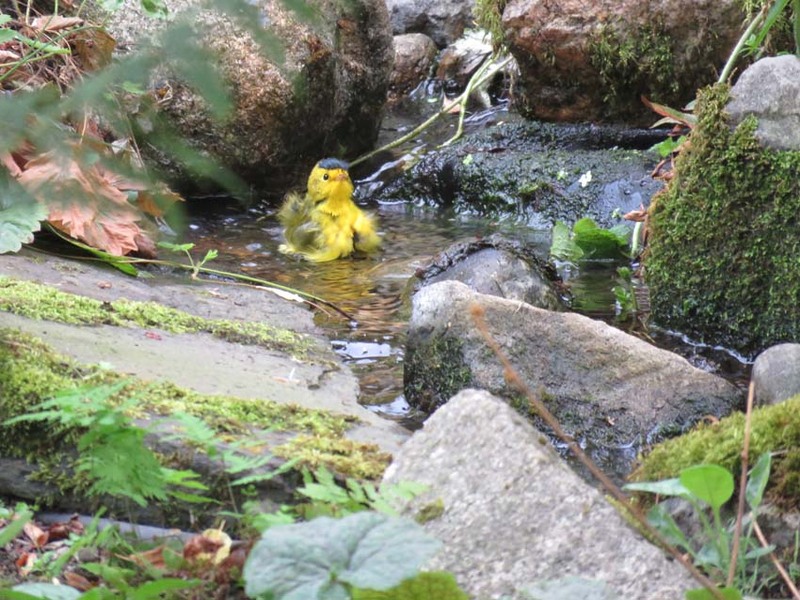 This Wilson’s Warbler was in our backyard on Beacon Hill, but it may have been heading for Cheasty. 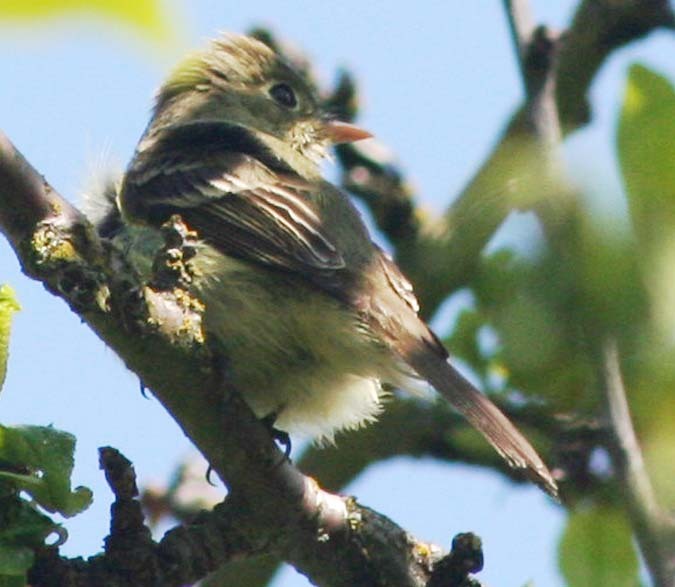 Wilson’s Warblers have maintained a breeding presence at Cheasty in the past 20 year period. They are a mid-canopy nester and forager and as a neotropical migrant that is mostly insectivorous, the species is in the crosshairs of the 6th Extinction. The Seattle Parks and Recreation Dept. tried previously to get a plan to put mountain-bike trails into Cheasty. The plan’s DNS (Determination of Non-Significance) was challenged in Court. and the Hearing Examiner ruled in favor of the challenge. Parks has made changes to their mountain-bike-trail plan and is now aggressively and secretively pushing a revised-but-essentially-similar plan through the required process. What do I mean by secretively? The plaintiffs in the last case had to look deep onto the Parks website to find any mention of anything to do with Cheasty and had to inquire with Parks to make sure what was happening and when deadlines were. Parks nicely timed the whole thing to correspond with mid-term elections, (of interest to many in Seattle!) but grudgingly agreed to add a couple weeks to the comment deadline, which I believe was extended slightly and now this Monday Nov 12, but I’m not sure and I will check this fact! Why are parks often colored Green on maps? The most famous parks, like Yellowstone and Yosemite, are unabashedly devoted to safeguarding and preserving nature. They have achieved enormous popularity and acceptance. But smaller park administrative jurisdictions have moved away from the model of saving and stewarding nature toward a model of partnering with various entities in the recreation industry. Park Departments provide the land and infrastructure, recreation organizations provide the political support and enthusiasm when policies are challenged. While riding on the popularity of the word “park,” these departments have ceased to prioritize the nature-preservation aspect of their mission. “That’s ridiculous,” I hear some people say. Indeed, we can point to many projects going on in the Parks that are spot on with this mission: See the two accompanying photos. The South Meadow at Discovery Park has played host to a LeConte’s Sparrow and a Harris Sparrow in 2018; in places I’d call it a conservation success. 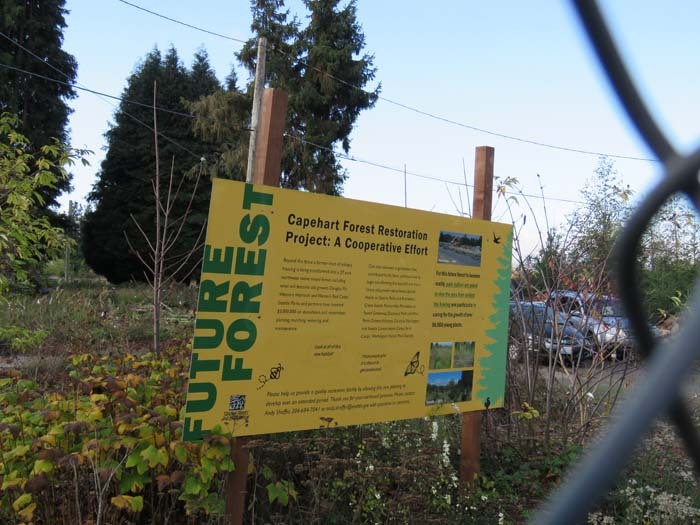 The Capehart restoration at Discovery Park is not open to the public yet but looks great, although I would call it somewhat over-conifer-planted. ( I have opinions but no credentials in this area). There is too little interest and too many other bad things are going on in the world for this subject to get much ink or electrons, but the extinction process is in full swing right here in Seattle in the present tense. We essentially have just last year finished losing the Barn Swallow as an upland-residential breeder. We continue to see Violet-green Swallow declines. In the last 15 years the Vaux’s Swift has become extirpated in Seattle although my knowledge is not complete and there is a chance some hang on somewhere here. In the fifteen years before that, the Band-tailed Pigeon, the closest living relative of the Passenger Pigeon, disappeared from it’s former stronghold in North Capital Hill/U-District. Our last American Kestrel family failed for good in the 80s at Interbay. The list goes on, but it’s important to understand that it follows a general pattern to some degree. 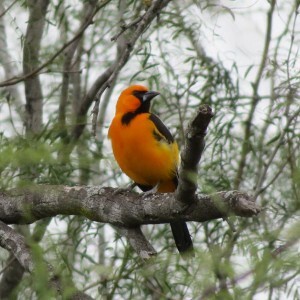 Not all species are in trouble, and some are expanding, but the danger of ultimate extinction is very real for birds that have these risk factors: First, birds that fly to catch flying insects. Second, birds that eat mostly insects. 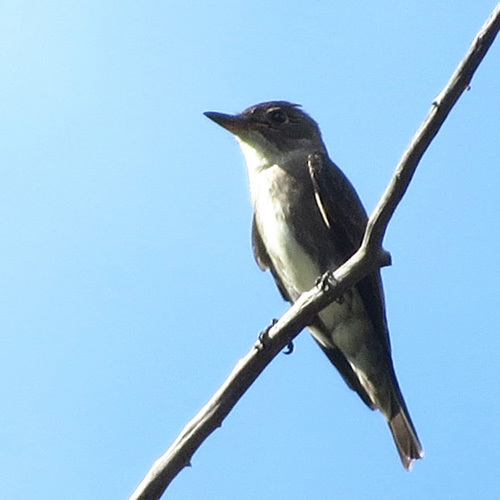 Third, birds that migrate to the neotropics in winter. This describes a number of birds that traditionally nest at Cheasty. The danger of these birds being lost in the near-future is high, and factors other than inadequate breeding habitat could end up being their biggest challenge, but if we care about the 6th Extinction, we shouldn’t mess with that risk. Injury epidemiology is a notoriously difficult area of research, and it’s therefore hard to discuss the dangers of mountain-biking in a meaningfully statistical way. But that should slow down the Parks rush to give Cheasty to this sport. I was personally shocked and saddened and somewhat angered to learn that a mountain-biking coach was killed just last year in a single-bike ‘accident’ (There is no such thing as an accident) on Bainbridge Island. (I say angered because I live in a permanent low-level state of anger toward all danger sports that all promote varying levels of safety-irresponsibility. I have lost 6 friends I treasured and that the world needed in my own lifetime so far to danger sports and in some cases I put a significant amount of the blame on the relevant recreationa industries. 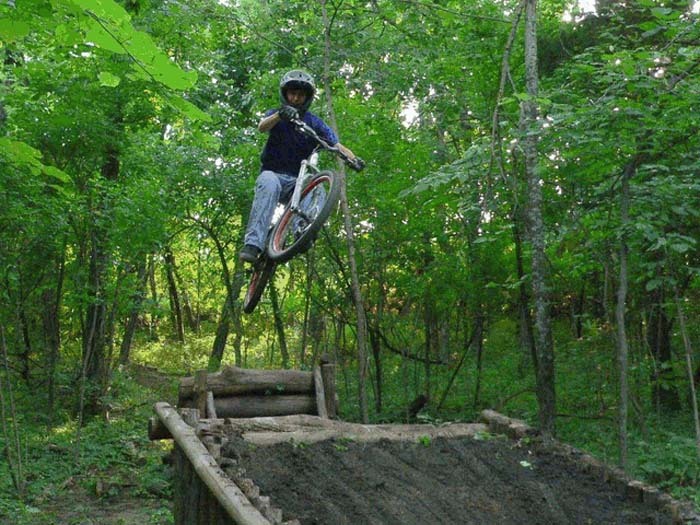 Those who favor the transfer of ownership of Cheasty from the general public to the Mountain Bike industry have made a mountain out of the subject of restoring native vegetation to Cheasty. People need to remember that this piece of land is currently in our ownership, and even with conservation covenants is worth millions. Ownership decisions should not be based on the enthusiasm of volunteers over a five year period during which time the work was a cause celebre and the group is essentially in a ‘courtship’ mode with the public, the press, and the bureaucracy. However, I feel it’s important for me to say that my hat is off to everyone and anyone who has put in even a half an hour doing restoration work at Cheasty or any other site for that matter. It’s wonderful that people take time out of their busy lives to do this. But restoration of park natural areas is a long-term issue. Land use decisions should not be based on current volunteerism activity levels of groups that are competing for land-grants. The city should not be trading acres for volunteer work. The fact that there is never a long-term binding contract involved should help make that point even more obvious. There are also other issues. Restorers perhaps should be more aware of bird nesting in late April, May, June, and July than they sometimes appear to be. The Norway Maple issue should be put to bed. Now with Big-leaf Maples in a die-off, to remove the Norways would be a really bad idea. (Warblers don’t look at an insect on a leaf and say,”I only eat insects on native vegetation!”) There is also in my opinion too much favoritism directed toward coniferous over deciduous that is not limited to Cheasty but can be seen regionally in restoration efforts. I’ve even seen Doug Fir planted in the riparian zone right next to the Snoqualmie River in the Carnation Valley (Doug Fir is a tree of well-drained soils and normally doesn’t occur very much in NW riparian areas.) My views on conifers might be easily dismissed as although I’ve been a NW observer for 42 years I have no credentials and no expertise in the area. But in a recent e-mail exchange Dr. Dennis Paulson, former Curator of the Burke Museum, author of 9 books and numerous papers, agreed most emphatically, wondering why the restoration community is so smitten (not his words) with conifers when the rarer angiosperms usually have more value for wildlife. “It’s another case of the tail wagging the environmental dog,” Paulson wrote. 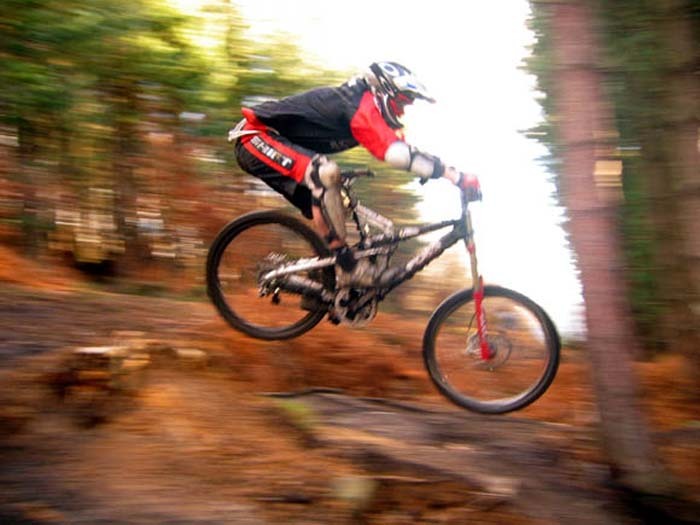 Mountain-biking participation peaked in 2001, and has remained relatively steady since, according to the International Mountain-biking Association of Canada. We are now seeing the inventions of new sports at an increasing pace, with Ultimate Frisbee, Disk-golfing and Zip-lining arising in recent times to demand land from public agencies and plead mistreatment if they don’t get it. Cheasty is right next to a 121 acre golf course where the non-playing public is entirely shut out and should probably be on the lookout for incoming stay balls even when using the public sidewalks on the perimeter. Must the public always be served by a Parks bureaucracy that couldn’t care less about them but is always scrambling to donate their land to any new user-group that comes down the pike? Really, the issue is the land. If you see Chesty on a map you may hear it’s 47 acres. If you actually visit it and walk around, for me anyway, it’s very hard to wrap my head around the fact that it is that big. Besides being very steep in places, it is extremely narrow for most of it’s length. It’s shaped like a snake that just ate something very big, and then, add to that, it is seasonally very wet and in places always wet. If this were a large piece of upland forest, it would be fine to have two sets of trails. But in Cheasty, there is no room for this. And finally, if we value and truly ccare about nature, we can’t in good conscience bar the citizenry from more of their own land. I’m a believer in natural law, and the dealbreaker for this current incarnation of Park Department irresponsibility is this: A person in a wheelchair will not be allowed to see any of Cheasty. That’s absurd and intolerable in this era. The Parks should withdraw this plan. A Yellow-rumped Warbler migrates through Cheasty in the spring. Their is a rivulet of migratory birds that use the east side of Beacon Hill every spring and fall. 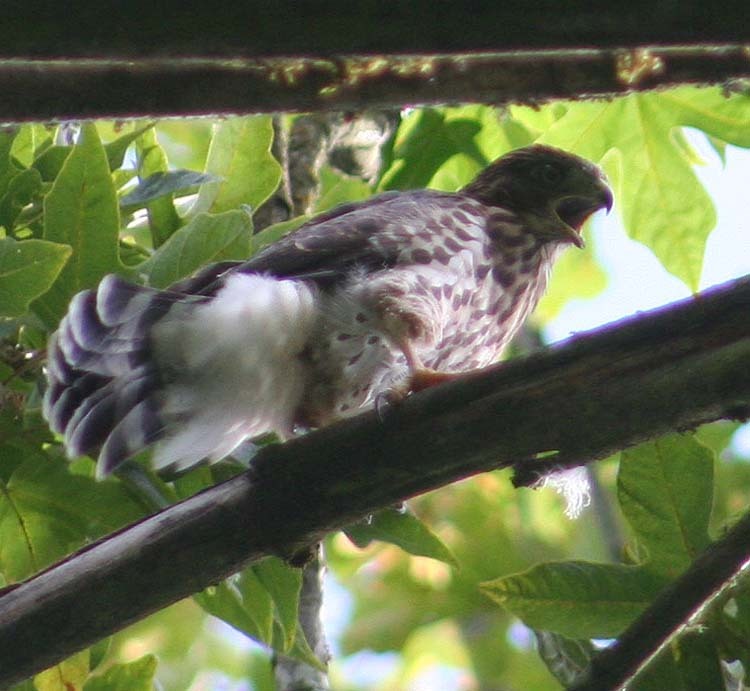 This young-of-the-year Cooper’s Hawk was begging loudly at Cheasty one day. Ed Deal, who has conducted an exhaustive multi-year study of the Cooper’s Hawks in the Greater Seattle Area has told me that the Cheasty Cooper’s Hawk pair has over the years had the highest productivity of any Cooper’s Hawk pair in the area. But it’s wrong. Suppose Paintball was wildly popular in Seattle. People would say, “Paintball gets kids out in the woods!” And the paintball groups might well be able to promise Parks many volunteers from the community to help with needed restoration. Parks would then try to make Cheasty a Paintball Park. The general public might be told it could go there at certain times of the day or week. In this hypothetical world, it might be very popular to make Cheasty a Paintball Park, but it wouldn’t be the right thing to do. This land belongs to everybody, not just people who are into a certain form of recreation. Here are my comments in regard the Cheasty Greenbelt proposal. The Parks Dept is acting like a ‘captured bureaucracy’ with Cheasty Greenspace. First, in an opaque process, it designated a user-group to whom to gift the land. Then Parks tried to move through the required process as quietly as possible, using the understandable joy of the user-group as evidence for the plan’s approval. But this is a bad plan! When we give land to a particular user-group, the general public gets excluded. We will be banned from most trails–from ever truly seeing Cheasty. Less-abled people will be denied access completely. 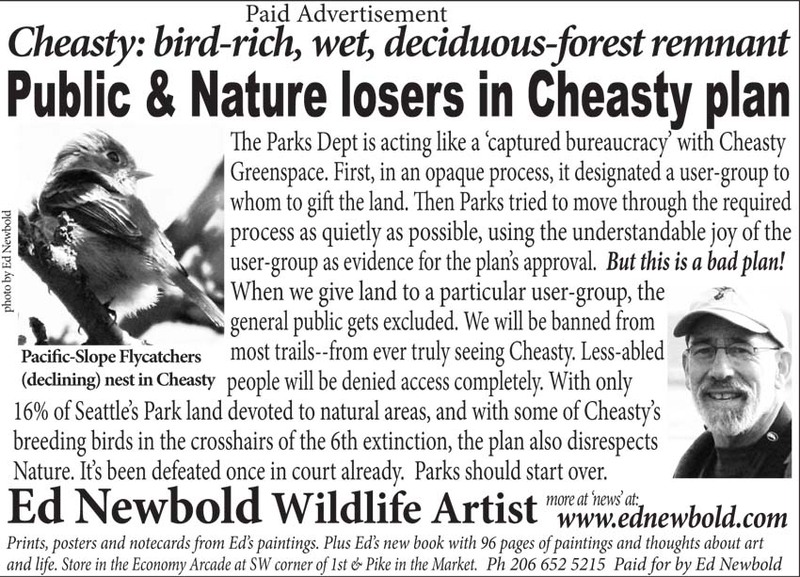 With only 16% of Seattle’s Park land devoted to natural areas, and with some of Cheasty’s breeding birds in the crosshairs of the 6th extinction, the plan also disrespects Nature. It’s been defeated once in court already. Parks should start over. Violates the spirit if or if not the letter of the Americans with Disabilities Act. It should strike everyone as wrong to build access to public land in Seattle for healthy young athletes while completely banning all those in the population who are lesser-abled. This alone makes the plan a non-starter. This plan will intentionally create an infrastructure fraught with danger at a time when we all should be thinking more, not less, about safety. Injury Epidemiology is a difficult field that is somewhat still in its infancy and no one can predict with certainty how many injuries-per-year this project will host, but the glib dismissal of the entire subject, showing that Parks has done no research and has no interest whatsoever in this subject is very, very troubling. This is in the shadow of the recent single-crash fatality of a very able-bodied Mountain-bike Coach on Bainbridge Island last year. In order to pave the way for its proposed land giveaway, Parks has constantly disparaged Cheasty all along, accusing it of being infested with invasive species and trashed when this has never been true, as measured against other natural areas in the region, none of which are free of invasives. The Norway Maple issue has always been a red herring, especially now that the native Big-leaf Maple is starting to become a victim of the sixth extinction. There is biological ignorance in the dismissal of the importance of deciduous habitats. Many of the native birds that do so well in Cheasty are deciduous specialists and are more at risk, in the global scheme of things, than are our coniferous-specialist species. I am thinking here of Pacific-slope Flycatcher, Wilson’s and Orange-crowned Warbler, and Warbling Vireo among others. These birds are also mid-canopy foragers and mid-canopy nesters, so what happens on ground level would definitely impact them. Mountain-biking participation peaked in 2001, and has remained relatively steady since, according to the International Mountain-biking Association of Canada. We are now seeing the inventions of new sports at an increasing pace, with Ultimate Frisbee, Disk-golfing and Zip-lining arising in recent times to demand land from public agencies and plead mistreatment if they don’t get it. Cheasty is right next to a 121-acre golf course where the non-playing public is entirely shut out and should probably be on the lookout for incoming stray balls even when using the public sidewalks on the perimeter. Must the public always be served by a Parks bureaucracy that couldn’t care less about them but is always scrambling to donate their land to any new user-group that comes down the pike? Giving Cheasty to a user-group rather than the citizenry, including those who live in its general vicinity, continues the tradition of mistreating South Seattle, the roots of which are racial in nature. 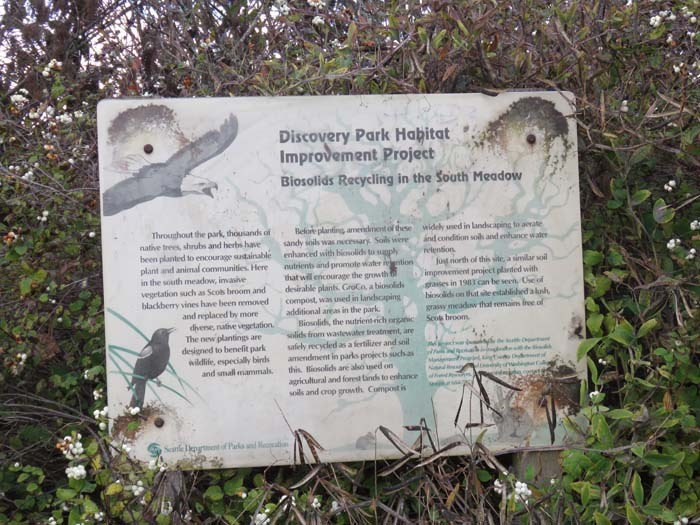 Parks thinking on biology is still reflective of the 70s, when there was lots of good habitat left in private hands everywhere and when certain vulnerable species populations weren’t already showing signs of collapse. Parks overall has not asked itself at the highest levels how it, as Seattle’s largest landowner, should respond to the 6th extinction. 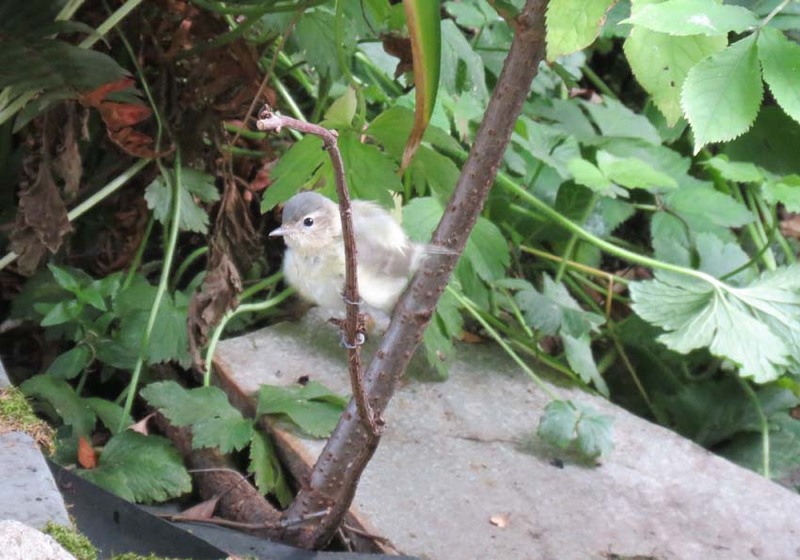 This is despite the fact that this phenomenon is in full swing in Seattle, as the current loss of upland-breeding Swallows of both species is showing, along with the decline of formerly abundant-in-Seattle species such as Vaux’s Swift, Band-tailed Pigeon, Olive-sided Flycatcher. Were Parks interested in this subject, it would attempt to create a Seattle Rare and Endangered list nd try to use this list to guide it’s topmost decisionmaking. Were it to do this, the importance of Cheasty as a centrally located rich, wet deciduous forest remnant would become glaringly obvious. In conclusion: Please shelve this plan and start over, from the beginning. 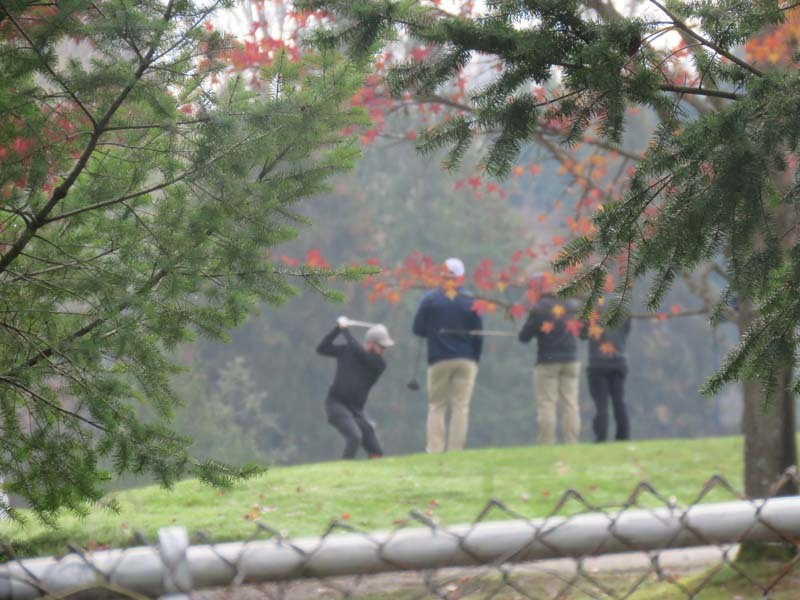 Golfers at the public course in West Seattle’s Delridge community. Members of the non-paying Non-athletes group of citizens must stay behind the fence. Longfellow Creek, the bed of which is being restored and made available for the citizenry, is buried and abused along the length of the public golf course. (Not that I’m down on golfers or users of these courses, but the presumption that government must provide for every user-group must be teed up and whacked.